Better late than never. 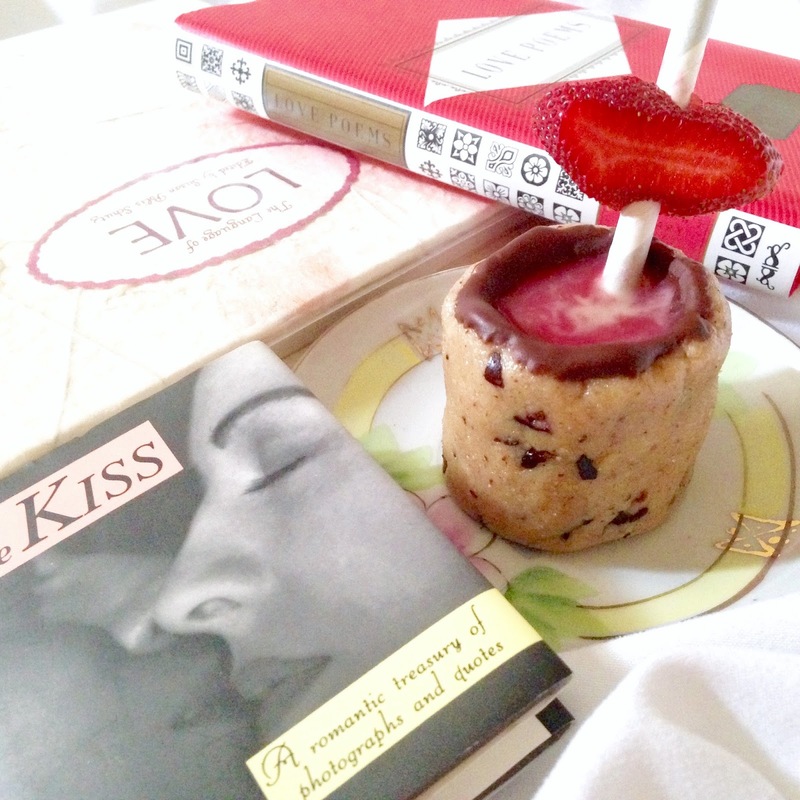 I mentioned the possibility of a food post for Valentine's Day, and I almost didn't deliver. Thank goodness that I had a craving for Suja Juice and cookies, just in time for the big day. 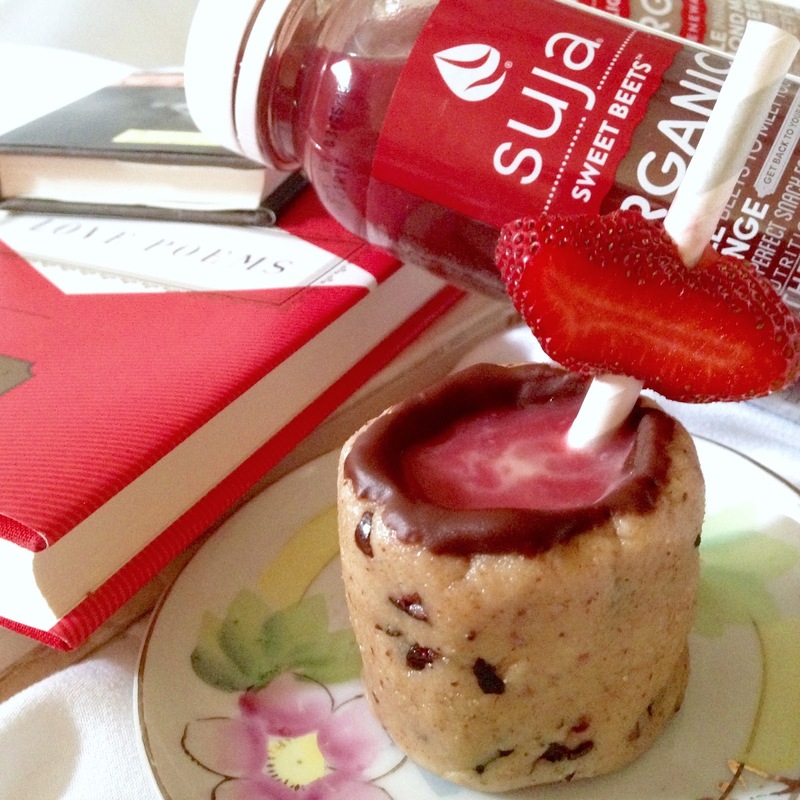 Suja's yummy red Sweet Beets organic cold pressed juice and pink Twilight Protein are the perfect love potion, and the best way to serve it is with cookies ... make that cookie dough cups. In my house, I do more "unbaking" than traditional baking, so these don't require a special baking pan and oven. You can even get the kids involved to form the cups, but let's not get ahead of ourselves. You've gotta make the dough first. 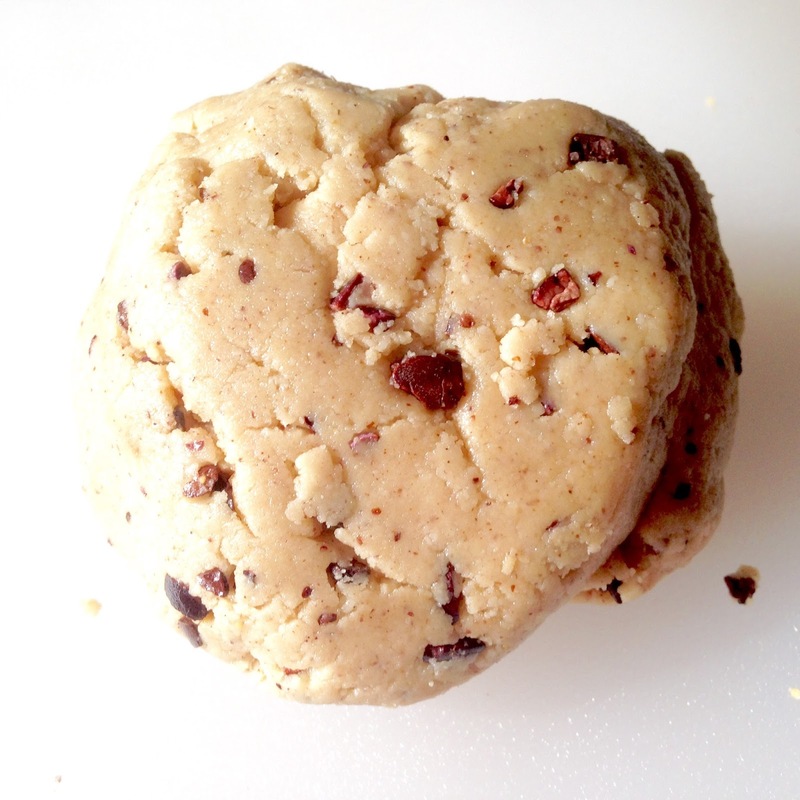 To make the cookie dough, add 1 cup almond four, 1 Tbsp. Philosophie Coconut Magic Coconut Butter, 1 Tbsp. Philosophie Cacao Bee Honey, 1 Tbsp. 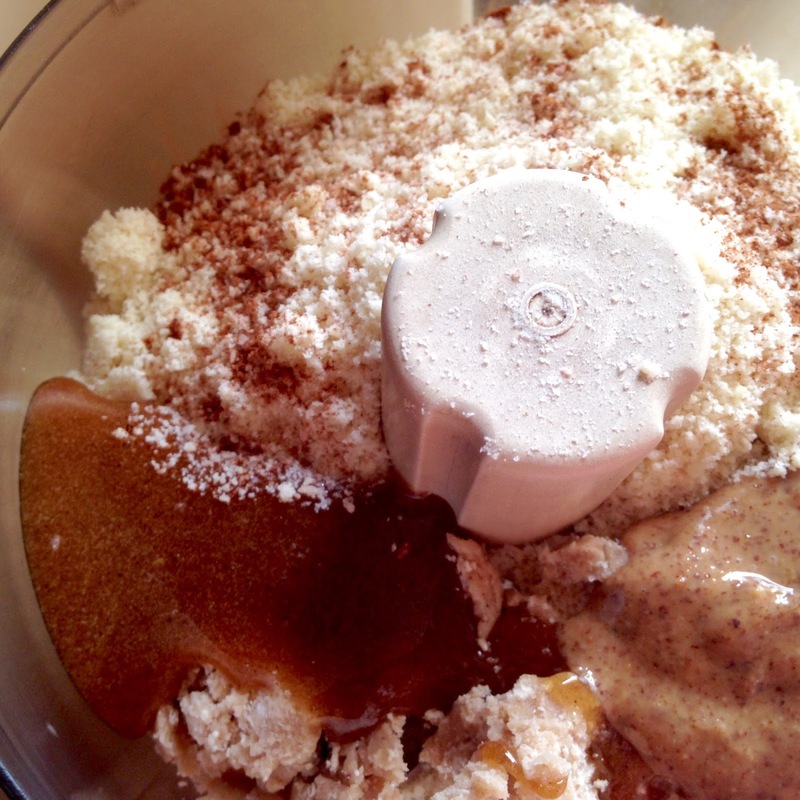 almond butter, a dash of sea salt, a sprinkling of cinnamon and a 1/2 tsp. of vanilla to a mini food processor. 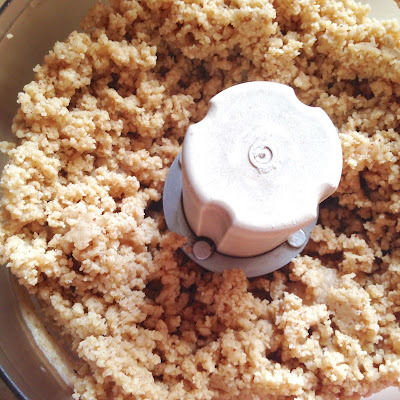 Process your ingredients into a sticky crumb, as shown. 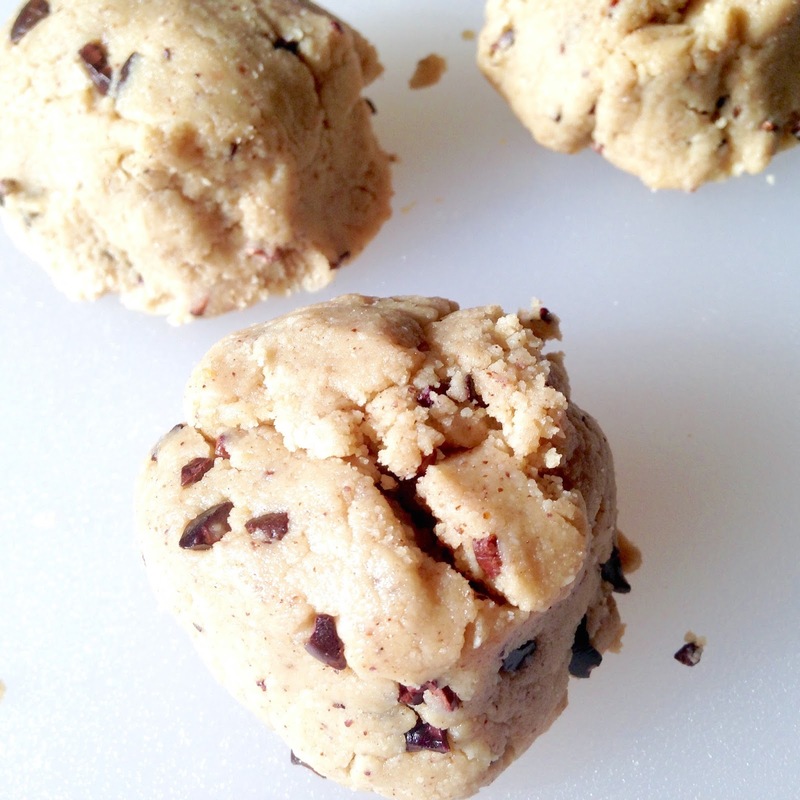 Add a handful of raw cacao nibs to make this a chocolate chip cookie dough. Give your mini food processor a spin to incorporate the "chips." 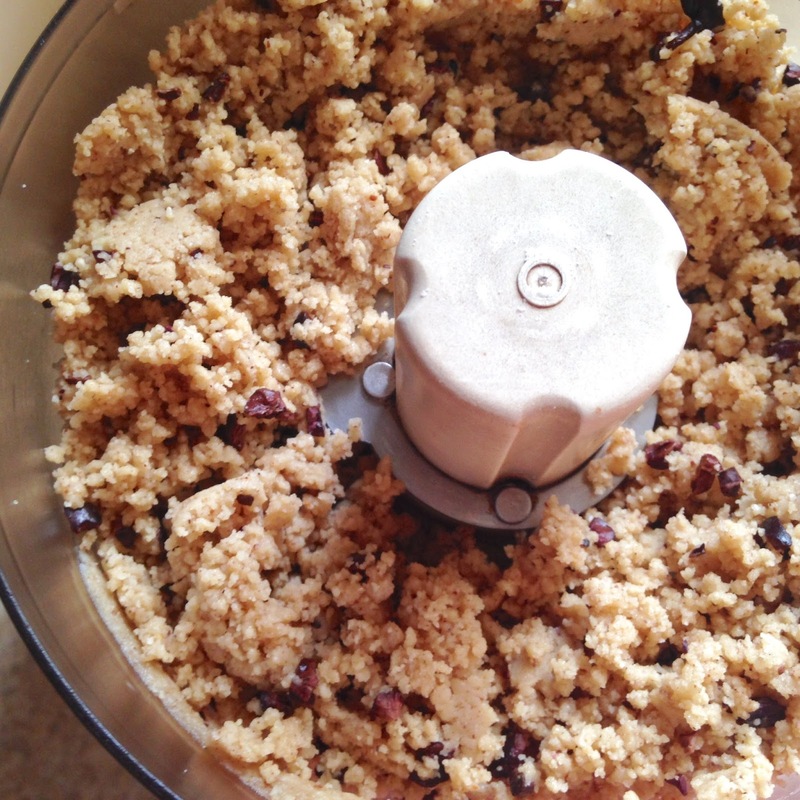 Remove your cookie crumbles from the food processor and gently knead it into a ball of dough. 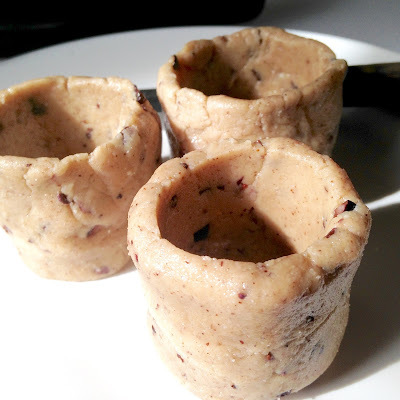 Divide your ball of dough into three equal sections, so you can form three cookie cups. 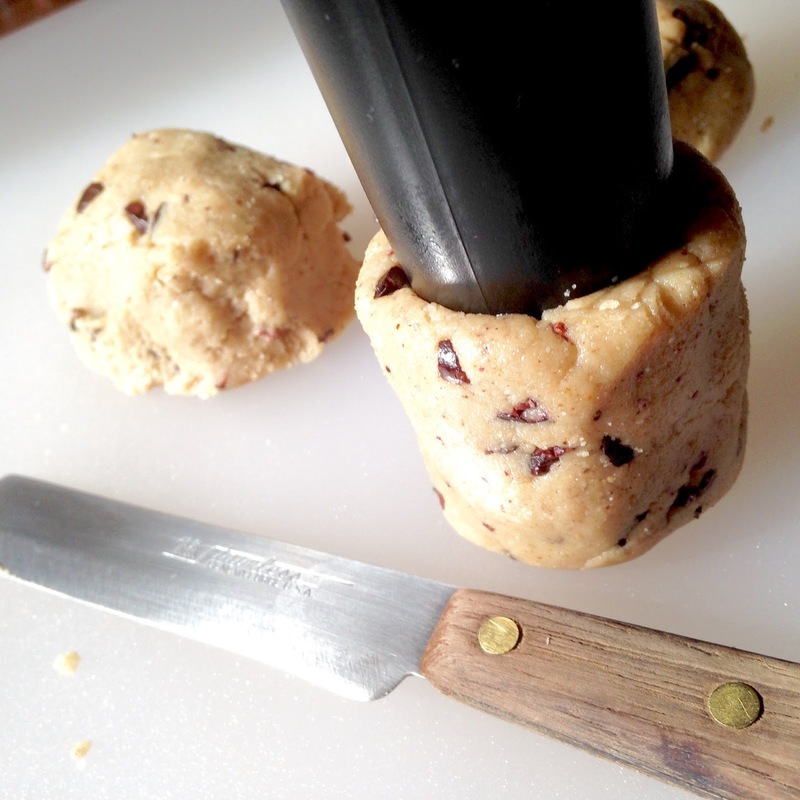 At this point, the dough can be formed into cups, as if you were working with play dough. How you form this is up to you. I used a tamper from my Vitamix to help shape mine and keep all three cups about the same size. Once your cookie cups are formed, you can skip the oven and put them in the freezer to set. The next step is to melt some dairy-free chocolate chips in a double-boiler. 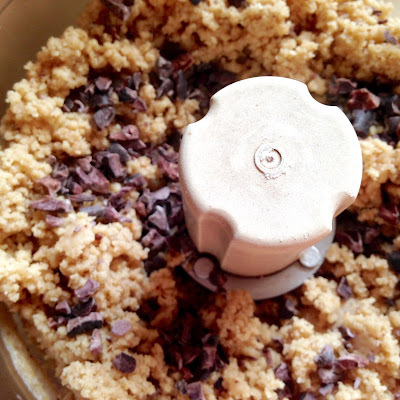 You could also make raw chocolate to keep this recipe entirely raw. 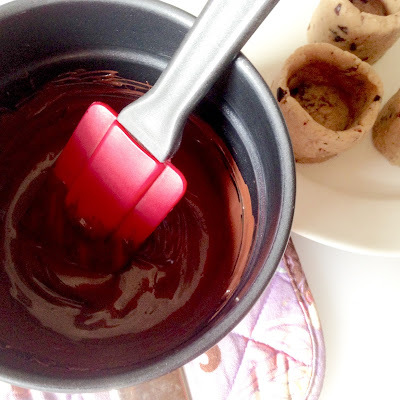 When your melted chocolate is ready, remove your cookie cups from the freezer for filling. 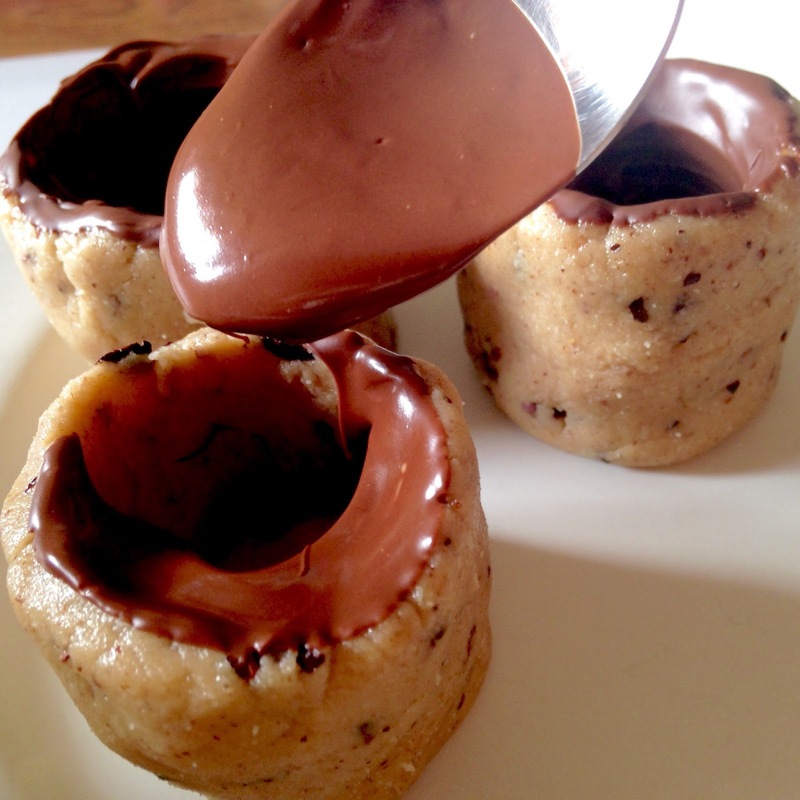 I used a spoon to fill my cookie cups with the melted chocolate. 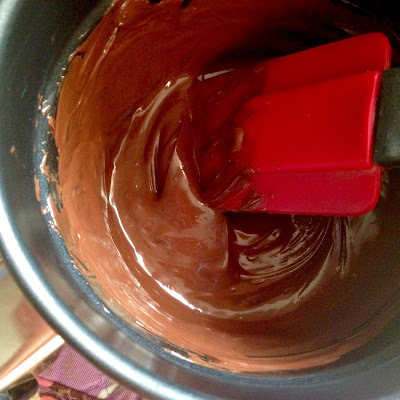 I lined the rim to allow the chocolate to run down the inside of the cups. Then, I added some more to the bottom and spread it around. 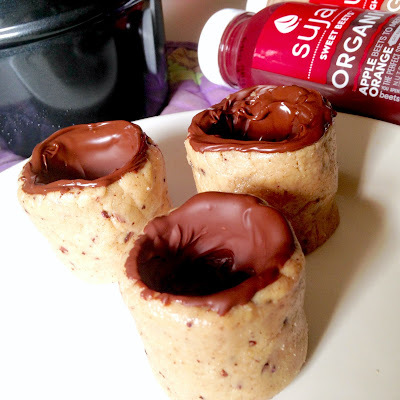 Put the chocolate-lined cookie cups in the freezer to set or to store until ready to use. I thought it would be fun to drink a red Suja juice and/or a pink Suja almond milk-based beverage out of these cups for Valentine's Day. I couldn't make up my mind when it came to which one, so I swirled both the juice and "milk" together. 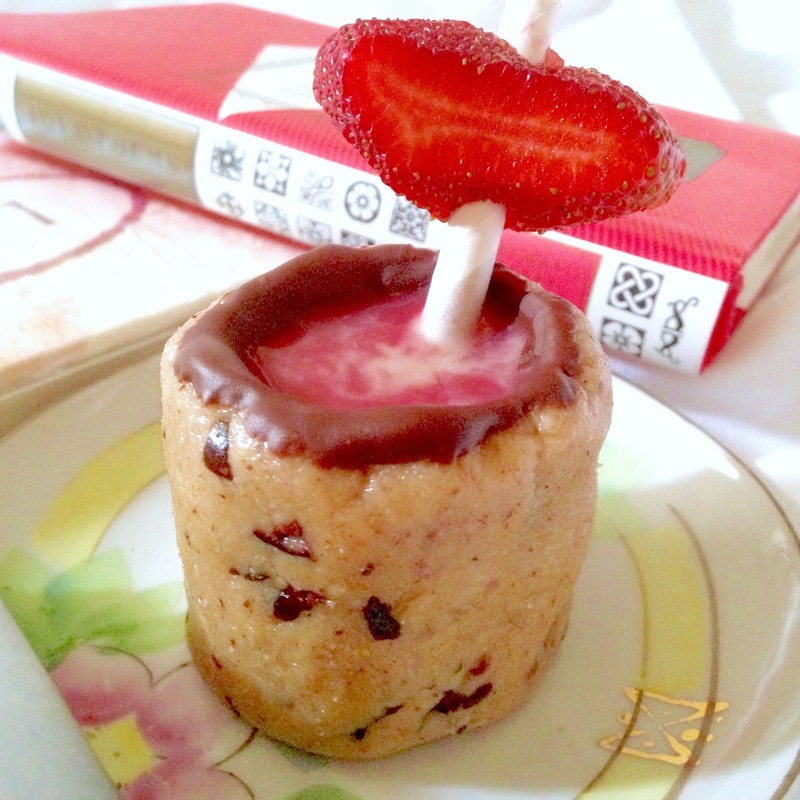 I also garnished my straw with strawberry lips (some strawberries look like lips when you slice them). 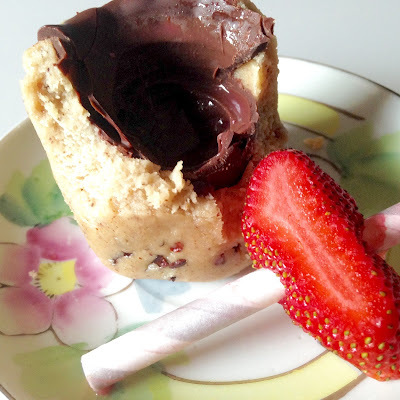 After having my juice, it was especially tasty to eat the no-bake chocolate chip cookie cup. Yum! Are you making any special treats for Valentine's Day? Let me know on Twitter at @Rawdorable and/or Instagram (also @Rawdorable). Happy Valentine's Day! Looking for more Valentine's Day recipes. Here's a link to a past round-up of my Valentine treats.